This entry was posted in Pixel Scroll and tagged Cordwainer Bird, D. Jeannette Holloman, Elon Musk, ENnies, Harlan Ellison, Howard the Duck, International Costumers Guild, J.R.R. Tolkien, Lego, Mars, Marvel, Mike Kennedy, Ridley Scott, The Right Stuff, The Starlost by Mike Glyer. Bookmark the permalink. Non Sequitur is in trouble. Wiley ran a Sunday strip in which a nasty word was pointed at Fearless Leader, and many papers are dropping him—for the word, not for the sentiment, according to most of the quotes I’ve read from the papers. I met Ed Bryant when he came to the Comic Center and talked about The Starlost (he’d written the novelization, with Ellison’s blessing), so I have a soft spot for the series, clunky as it was, and a certain fondness for the library computer guy. Osler? Running out of time to edit. Gotta hit save before it refuses (which happens before it reaches zero). (2) DTRPG/OBS is not a game company. They’re the largest RPG PDF retailer on the planet, and are the ONLY legal source for many publishers’ games. Even Wizards of the Coast (Publisher of Dungeons & Dragons uses OBS to handle their PDF sales (DNDClassics.com is just a D&D-specific portal to OBS. This is equivalent to Amazon cutting a publisher off – without OBS, it’s super-hard to make money selling RPG PDFs. The second-largest seller of RPG PDFs is Indie Press Revolution, and they don’t carry Zak’s products. @9: Youd also wrote at least one non-YA genre novel, Pendulum — imagine Alex and his droogs taking over. I’m pretty sure some of the other stuff in ISFDB is also genre, but haven’t read any in a few decades. (6) I’m very skeptical that any person who isn’t Steve Gerber can do Howard the Duck well (I still haven’t read the Chip Zdarsky series; I like Zdarsky but I wasn’t crazy about the bits of it I’d seen) and I am extra skeptical about Kevin Smith being that person. (1) I expect to hear any day now that Ridley Scott is dusting off yet another past triumph and working on THELMA & LOUISE 2: THE RETURN. (6) No doubt Howard won’t be sporting his trademark cigar. (11) I dread to think what bizarro version of 1900s Birmingham we’ll get. It has a taste like you’re about to be crushed by a giant metal man! It makes you levitate and hit your head on a rock! Thanks for the background on the Zak Smith affair. I have some e-books for sale at DriveThruRPG’s sister site DriveThruFiction. They’re great to work with and I actually prefer them to many of the bigger e-book retailers. (14) Okay, I’m going to focus on the really important point here: Public toilets that cost a dollar to use? Seriously? Oh hey, this one’s got New Zealand in it! (4) I couldn’t disagree with the lofty Nicolas Barber more strongly. I’d probably rank one ahead of two simply because it was completely new, but two was anything but a letdown. Loaded with fun, humor, and heart. 14) In Germany, public toilets usually cost 50 cents, i.e. only half as much as in Sweden. When I was a child, they cost 20 Pfenning (approx. 10 cents), then it went up to 50 Pfennig (25 cents), when I was a teenager (which infuriated me at the time, because the price had more than doubled and that at an age where I didn’t have much money). By the time of the changeover to the Euro, they were at 1 Deutschmark, i.e. 50 cents, so the price has remained stable since then. You pay cash, by putting a coin on the plate of the toilet attendant and sometimes by inserting it into the door or a barrier. The plate is the most common solution, because it means that users can overpay and tip the toilet attendant. BTW, toilet attendants say that homeless people are among the most generous of tippers. Once, during a stopover in East Berlin as a teenager, a friend and I needed to use the public toilet in the train station. The toilet cost ten or twenty Pfennig – I don’t quite remember. And since it was intended to be just a stopover, we didn’t have any East German money, so we both put the required amount in West German coins onto the plate. And the hand of the toilet attendant shot out lightning fast to grab the coveted West German coins (which bought goods you couldn’t get in East Germany) and slip them into a pocket of her apron. Of course, it was only small coins, but since we weren’t the only West German visitors to use her toilet, I suspect she got quite a lot of West German money. And New Zealand even gets to first contact locations. Data point: When I was a kid, close to sixty years ago and when pay toilets were common, the cost was a dime to enter. With four kids in the family, Mom or Dad would try to make sure the door didn’t fully close when the first kid came out, so another could go in and use it on the same dime. Cora Buhlert: And New Zealand even gets two first contact locations. I can’t read it very clearly, but it looks as though they are “Under the Mountain” and maybe “First Contact”? (15) I can’t believe the Los Angeles captions omitted one of the most philosophically challenging films in the first contact subgenre, and perhaps in all of cinema: Earth Girls Are Easy. “Under the Mountain” & “Bad Taste”. Soon Lee: “Under the Mountain” & “Bad Taste”. So it is! Your eyes are better than mine, I thought the first word looked like “Real”. 15) The map needs at least one correction. The official english name for Space Invasion in Lapland is Terror In The Midnight Sun. He is using a direct translation of the swedish title. 3) I’m not entirely surprised to learn he writes for Lamentations of the Flame Princess. Lots of edgelord misogyny in their material, and a certain amount of neoreactionary politics. 16) “Star Trek‘s Walker Koenig”? Whose typo is that? Or there something else going on here. It’s easy to remember how to spell Walter – it’s “Retlaw” (the poison plant in the ST:TAS episode “The Infinite Vulcan”) spelled backwards. 9) — I never knew that John Christopher wasn’t his actual name. And Andrew, the Tripods trilogy and The Lotus Caves were pretty foundational for me as well. @Lis, @Cora: my recollection of a trip three years ago is that pay toilets cost ~75 cents(*) in Dubrovnik, and ~60 in Vatican City and Nice. Unlike the US cases I remember from the 1960’s, the money was collected at near the front door and presumably went to maintaining the entire facility, not just the alleged seat sterilization that a dime bought Back Then. I won’t say you could eat off the floor in any of the recent spaces, but I recall them as being better than un-fee’d stops on toll highways in the US (which are part of a substantial income stream, unlike a public toilet in a city). @anthony Hahahaa. Bester is one of my favorite characters in Babylon 5 and it was quite the whiplash for me to see Koenig go from Chekov to him. Re: the Map: Large swatches of Earth which have never been first-contacted. This would be useful for someone trying to find an unused location. @Joe H: a number of mid-20th-century UK genre writers used pen names; offhand I can also point to John Wyndham (John W. Beynon Harris) and Richard Cowper (John Middleton Murry). This may have been an effect of a social-class system (writing popular fiction not being considered quite the thing); this may also have caused Boyd Upchurch to write SF as John Boyd while historicals and a work about formerly-HUAC were under his own name. And let us not forget Iain Banks’ almost impenetrable genre pseudonym, Iain M. Banks. @Chip Hitchcock: In the case of Cowper/Murray it may also have been because he was named after his father, the famous literary writer and critic. Joe H., he also wrote one of of the best books on whiskey ever done, Raw Spirit: In Search of the Perfect Dram. John Boyd wrote a book about HUAC? ETA: Which my best local library doesn’t have. But it is a smart library! 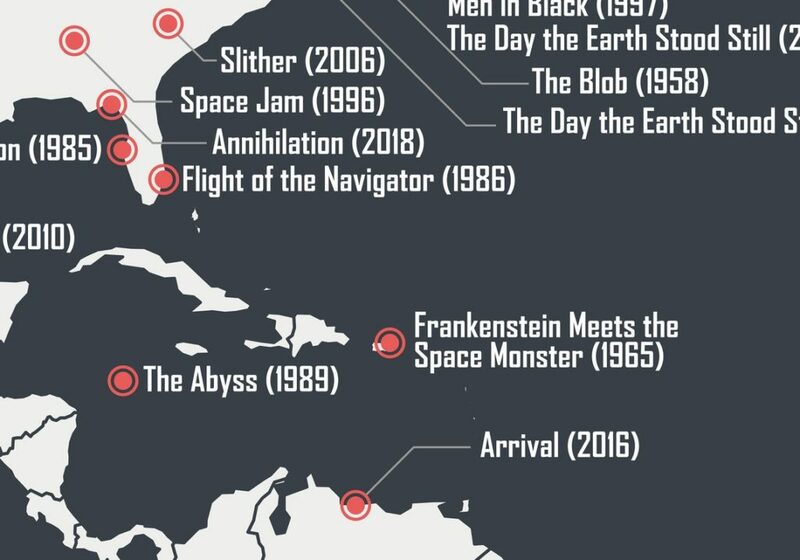 Well, they included all the locations where a ship was spotted in Arrival and Independence Day, so why not for V as well? (5) I think Counterpart is/was solid stuff. Good story/scripts and excellent acting. But the central premise was well explored through two seasons and was losing impact by the end of the second. A big factor in its getting picked up elsewhere will likely be how the writers plan on keeping it fresh. They missed at least one location from “Independence Day” – Los Angeles. That tall cylindrical building is across the street from the Central Library on 5th street, and it’s in the next block from where I worked. Ok I’ve never seen Starlost. Just how bad was it? I’ve never see Starlost, but all of this discussion of Walter Koenig convinced me that this would be a good time to watch my copy of Moontrap (1989, also starring Bruce Campbell). @Cat Eldridge: Pretty darn bad…. It’s not so much the low production values (the SFX people apparently promised a lot more than they could actually deliver), or the naff scripts – actors can have a lot of fun with naff scripts, sometimes, just look at the original Lost in Space. But with The Starlost, there’s this sense of leaden hopelessness which pervades the whole thing. Especially with the three main characters, who mostly act like they’ve only just seen the scripts, and are on so many downers they don’t really care anyway. I’ve seen quite a lot of bad TV, and I will generally look for any positive qualities I can actually find – I’ve managed to say reasonably pleasant things about Star Maidens, say, or The Tomorrow People – but The Starlost is a difficult one to like, because nobody involved with it seems to be having any fun. Betty Balantine has died. RIP. (9) Michael Ironside voiced Darkseid in the Superman and Justice League animated series, a top notch voice characterization choice among a wealth of top choices by voice talent casting director Andrea Romano. He also appeared as the naval squadron commander in X-Men: First Class, and played the antagonist in Heavy Metal 2000. Not to mention a lot of guest starring roles. 2) Oh god. Spent yesterday reading up on the history of Smith. Stalking people for years, being banned from RPG.net, this guy had a history. The well-known missing stair with an army of abusive followers that he directed to attack others. One guy even felt forced to leave the country when his followers started to make themselves known AFK. He has written some kind of “rebuttal”. I will not read it. I think it’s time to remake THE STARLOST — just go back to the original bible for the show, and restore everything that was cut because they wanted to make it cheaply. Both FX and the audience have caught up to SF done well on TV, and the notoriety of the original would add a little publicity to the proceedings. Someone like SciFi ought to snap it up. The OSR movement/scene/genre whathaveyou is a various and eclectic bunch of people who have almost no other relation to each other besides gaming. Scrap Princess, a transwoman with a really evocative art style that has had a hand in several very well regarded releases, like Deep Carbon Observatory and Veins of the Earth (one of the absolute best gaming books ever published…and published by LotFP). Her partner on those two books is the equally awesome Patrick Stuart, who has spoken out against ZS in the past. Anne Hunter who writes the DIYandDungeons blog and who is just a very thoughtful and emotionally intelligent person writing neat gaming material. The Hydra Collective is a, um, collective, of talented people who have produced a bunch of great gaming books. The collective includes Luka Rejec, who has created the amazingly inventive and original Ultra Violet Grasslands, now available as a kickstarter. I read his rebuttal; you made a good choice. There’s some of the “she said and did bad things too” type of defense and…yeah. ZS needs to go away. I think this will be the final nail in the coffin. I’m thinking in particular of No Salvation for Witches, Blood in the Chocolate, and Better Than Any Man – all of which feature women whose (in modern terms) progressive views and desire for agency turn them into literal blights on the fabric of reality. You’ll find touches of misogyny in a lot of the published material, though – The Stygian Garden of Abelia Prem, Broodmother Sky Fortress, Gingerbread Princess… and that’s without mentioning the illustrations in the main rulebook or the “Vaginas are Magic” supplement. What I’ve seen of other OSR work – mostly zines – is less overtly reactionary but the better stuff has a tendency to draw the style of horror that’s all about grotesque women and/or vaginas dentata, while the less good often gives me the sense that the writers used to spend a lot of time sniggering at the “random prostitute table” in the old AD&D DMs guide. It’s perfectly fine, of course, to enjoy problematic things and find what’s good in them, and there is good to be found here. But I don’t think there’s any point in pretending the problems don’t exist or are just easily-overlooked anomalies. I think this will be the final nail in the coffin. Sadly, I don’t think it will be. I hope it is, but this guy has been continuing to pop up for so long, now, despite periodic flare-ups of controversy. This is bigger and more severe than previous flare-ups, but in a few weeks, I suspect it’ll die back down and he’ll go back to (quietly) working for publishers who are willing to hire him. He’s not the only missing stair in the community, either. Gaming (not just the OSR) has a ton of toxic assholes. I can name four or five off the top of my head – and they all still find work (or self-publish and have an audience).